The Edmonton Oilers’ 2014/2015 season has not been good (understatement of the year), but when you look at how they match up against western division opponents; it has been downright pathetic. The Oilers are 5-25-10 against the west. They’ve been outscored 138 to 80. They’ve been outshot 1,230 to 1,068. They are 3-15-1 at home. Many things need to improve for this team to even become a contender, but the management, coaches and players all need to look within and realize they must change if they want to compete in the wild, rugged west. The Oilers wrap up their season with ten straight against the west, starting tonight against the physical Winnipeg Jets. Then they face Colorado, Dallas, Colorado, Anaheim, LA, Calgary, LA, San Jose and Vancouver. All of those teams will be battling for their playoff lives — Col, Dall and SJ are on the brink of elimination — and the Ducks are the only team safely in a playoff spot. The games won’t mean much to the Oilers, but they will mean a lot to the opposition, and that’s why the Oilers can use these games to measure where they stand. If they can win five of ten, that would be a huge accomplishment, but I’m not certain they can. This team is not built to compete in the west. I’ve said it for years, and despite numerous changes to the roster every season, management has yet to grasp what this team lacks. It seems everyone wants to blame the entire season on Dallas Eakins, but the Oilers have won only four of 15 games vs. the west with Nelson behind the bench. Coaching was only one aspect of this organization that needed to improve. It has since Eakins departed, but the team still has a long way to go to become competitive. This team has too many of the same players. You need skill, and the Oilers have enough skilled players, but they don’t have enough complementary players to surround them with. Benoit Pouliot was a good addition. He can play on your top line and contribute and he adds a different dimension with his tenacity. The Oilers still lack skilled size in their top-nine, and that has to be the main priority over the summer to improve the forwards. The blueline needs the biggest improvement. Oscar Klelbom is maturing nicely before our eyes, but you can’t ask him to play first pairing minutes if he is playing with Justin Schultz. Regardless of what the GM thinks Schultz can become, he has never showed the high-level desire and competitiveness to be a first pairing defender. 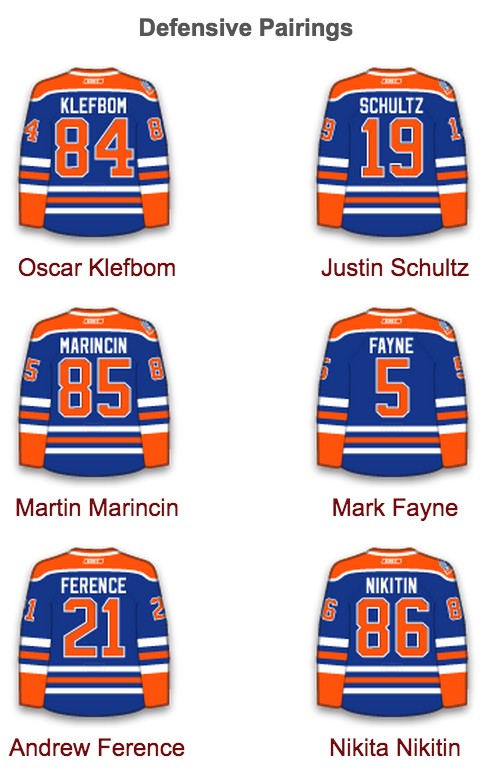 Mark Fayne can be a solid second pairing shutdown guy, and the Oilers likely can live with him taking the toughest matchups next season, but right now it looks as though the organization is hoping he can do that paired with Nikita Nikitin. Again, it is a gross overestimation of a player’s (Nikitin) talent. There is no quick fix for this team. Even if MacTavish can pull off a trade to acquire a top-pair defender (it is extremely unlikely), they still have other holes to fill like goaltending, forward depth and defensive depth. I won’t say these ten games are meaningful, but their opponents will be playing for a playoff berth, so the Oilers should at least get a sense of what it takes to become a playoff contender. The players who are on this team must become more consistent with their work ethic, decision making and their overall competitiveness in the tough areas of the ice. Watch how hard the Winnipeg Jets battle. The have a nice combination of size, skill, grit and determination throughout their lineup. They are extremely physical. They punish teams. I don’t expect the Oilers to match their physical play, but their desire needs to be equal to the Jets. No lineup changes. Martin Marincin will stay with Andrew Ference while Nikita Nikitin stays with Mark Fayne. Jordan Eberle is once again amongst the top-30 scorers in the NHL. Since he entered the NHL in 2010/2011, he has scored the 26th most points in the NHL with 279. He is an elite point producer. He is never going to be a physical player — accept it, that isn’t his game. He is 26th in goals with 116 and he is 24th in ES goals at 83. If you trade him it creates a huge void of offence on the right wing. I’m not against trading him, but the return needs to be very good and people need to recognize that Yakupov can’t fill that offensive void. I’m sure the Flames will try and re-sign Karri Ramo. Hiller only has one year left on his deal, but if he makes it to unrestricted free agency he is the goalie MacTavish should target. I’d rather sign him than Antti Niemi. I love how the Jets play. I don’t think they have the top-end offensive players to make a long run in the playoffs, but they will be a handful for the Ducks or Predators, if that is who they face in the first round. Tyler Myers has been exceptional for them since coming over from Buffalo. Their top-four D is very solid with Byfuglien, Trouba, Enstrom and Myers. Who would you pick as top D-man on the Oilers this year? I agree with the decision to send Ryan Hamilton back to OKC and use the final recall on Andrew Miller. Hamilton will not be a regular NHLer in the future, but Miller has progressed during his second pro season and he does have NHL speed. I’d rather see them play Miller for ten games to see what he can offer. The Winnipeg Jets are feeling really good heading into a two-game road trip that starts Monday night against the Edmonton Oilers. Winners of four straight games, the Jets (37-23-12) have a cozy four-point lead over the Los Angeles Kings for the final wild-card spot in the Western Conference with just 10 games remaining. That being said, the Winnipeg can’t take its foot off the gas pedal against the lowly Oilers. “We believe we’re going to make the playoffs, but it would be a mistake to be too high. We feel really good about ourselves, but that’s it,” Jets goalie Ondrej Pavelec told the Winnipeg Sun. GAME DAY PREDICTION: It will be an entertaining game, but the Jets need to the two points and the Oilers can’t handle their physical style of play. Oilers lose 4-2. 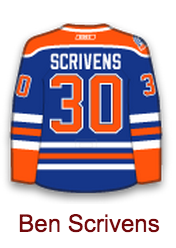 OBVIOUS GAME DAY PREDICTION: The Oilers have allowed 36 goals during the past nine games. They keep pace by allowing four tonight. NOT-SO-OBVIOUS GAME DAY PREDICTION: Miller scores his first NHL goal in his third NHL game. His mother will be in attendance tonight, and like most hockey players you always get a boost when your parents are watching. Oops! I added the wrong roster card. LE FIX! The Oilers will make the playoffs next season, we are so much better than those flames and jets, they are just having lucky seasons! 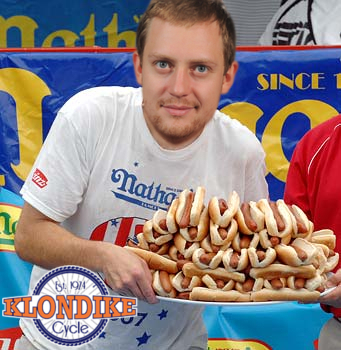 Shultz will outscore Giordano next season — I mean cmon… that guy wasn’t even drafted, King LEON is a legit #2 threat next year, stop worrying about Petry and Perron — they STUNK and they questioned my authoratay, AND I am planning on bringing Eakins back so were alllllll goood in the city of champs. Should be a good game tonight! Go Jets Go! If they lose 9 of the last 10, I can deal with it, as long as that 1 win is against the Flames. 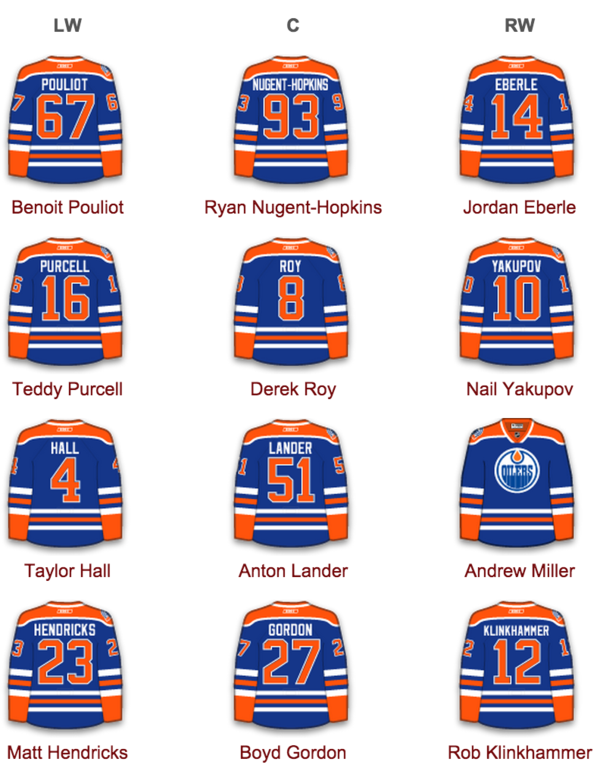 A Hall-McDavid-Yak line to follow the Poiloit-RNH-Eberle line is one of the only things that would give hope for next year though. How is going into next year with yet another undersized 18 year old center a good thing?? Dylan Strome is looking pretty legit as well, I wouldn’t be too worried about picking 3rd or 4th. We’ll still get an above average player/prospect. Gotta fix that d and goaltending if we are going to compete next year. I agree with you, I always want to see a win against the Flames. But I could see it actually kicking the Oilers in the @ss again. Remember the 2007 draft? Oilers were in fifth last place, last game of the year was against the flames. They win that game and it puts them into 6th last place (putting Chicago in 5th) and guess who wins the lottery? lol, yup that’s right. The Oilers get Gagner and Chicago gets Patrick Kane. Even when winning games, the Oilers find a way to screw it up. A loss in the last game of that season would have actually placed us fourth last, not fifth last. The Oilers jumped both the Blackhawks and the Capitals with that last win. Also, the odds are a crap shoot now, so losing hardly gives you a better chance at McJesus (last=20%, 2nd last=13.5%, 3rd last=11.5%). Those are all bad odds, and no matter where the Oilers finish, it’s very likely that they don’t get McDavid. So how about we work on that culture problem and actually try to win games for once? Sheesh, I know the games don’t technically mean anything, but they haven’t since late October. Even the fans of the Oilers have a losing culture!